What a great spring Saturday afternoon to write a blog post about DOUBLE dry-hopping, a hallmark of the Parched Eagle’s flagship beer Hop-Bearer IPA! What’s dry-hopping, you ask? It’s the addition of hops a few days before a beer is kegged or bottled, after (primary) fermentation. Adding hops at this stage adds considerable hop aroma, which also affects how the beer tastes as much of what humans taste in beer actually comes from our sense of smell. More on that in a future blog post. OK that’s single dry-hopping. Double dry-hopping is the addition of hops post fermentation on two different days (e.g. first addition a week before kegging, second addition four days before kegging). What does this do? It adds a depth of complexity of hop aroma/flavor to a beer. Another way to put it is double dry-hopping adds an extra layer of hop aroma/flavor. There are options with this process e.g. 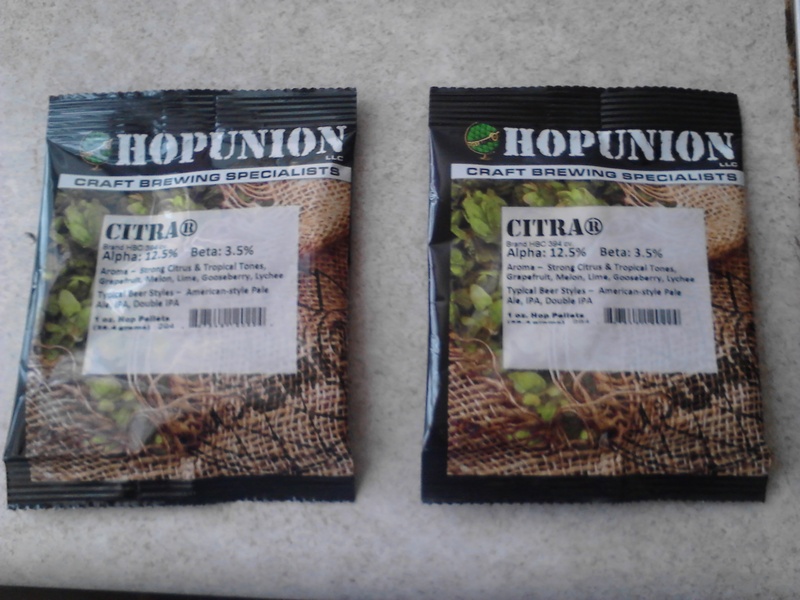 using a different hop variety for the second addition to add even more complexity. Another option is after the first addition change the temperature of the beer slightly for the second addition to take advantage of the many different compounds in hops (e.g. essential oils, which volatilize at different temperatures). A practical brewing reason to dry hop is to prevent the large accumulation of hops at the bottom of a conical fermenter to such an extent that hops at the very bottom are not fully infused with beer as the hops accumulating above them act as a sort of beer shield. OK here’s an admission: I’ve never actually dry-hopped BUT I’m about to as I recently brewed the pilot batch of Hop-Bearer and will double dry hop it (with Citra hops) seven and four days before I keg it for a Parched Eagle investor relations party in late May. I’ll also do the second addition after the beer is chilled by about 7-10 degrees, hopefully adding even more hop complexity. I’m confident it will work as it just makes a lot of sense and my sources who advocate double dry-hopping are quite reputable. I’ll do another post on the results of dry-hopping the pilot batch of Hop-Bearer in a month or so. Hop Heads of the world unite! What’s a sour beer, you ask? An ale fermented with wild yeast strains, most commonly Lactobacillus, Pediococcus, and the holy grail of wild yeast: Brettanomyces. Co-founder Tom and I are big fans of sour beers, and I’ve had pretty good success (luck?) brewing a couple of different sours on the homebrewing level. We intend on having a separate one barrel brewing system for sours that will be entirely separated from our main 3.5 barrel system. We need to do this to ensure that the wild yeast strains used for our sour beers do not infect the equipment used for all our other beers as while sours are a special world of wonderful beers, nonetheless the flavor characteristics (sour, tart, acidic, barnyard, horse blankety) imparted by wild yeast strains really don’t work for, say, Hop-Bearer IPA or Pegboy Pils. The main sour ale we will offer is Brookie’s Sour Brown, my attempt at a Flanders Brown Ale (aka Oud Bruin). One of the best beers I’ve ever had is Liefman’s Goudenband, a wonderful blend of sweet & sour with rich toasted malt sweetness coupled with an elegant sour flavor in the finish. That beer is the inspiration for Brookie’s Sour Brown. As wild yeast strains take a long time to ferment beer Belgian brewers usually let their sour ales age for upwards of two or three years and often blend old (two or three year old) batches with “young” (one year old) batches. We won’t really have the luxury of that much time for aging Brookie’s Sour Brown, rather I plan on aging it for around six months (and not blending it). In my experience using the Wyeast Lobs Roeselare Ale Blend that’s enough time for a nice/somewhat restrained sour character to develop. There’s a good chance we’ll use wooden barrels to age it in, as well. 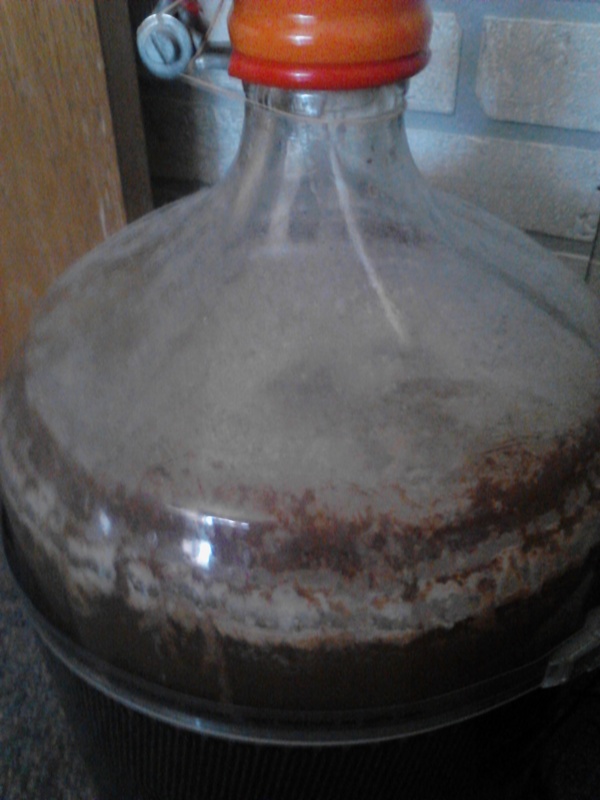 Meanwhile for the past 19 months I’ve had a lambic, a pomegranate lambic no less, slowly fermenting away. A full yet smooth, dare I say it sublime sour character has slowly developed with this the old batch. Then in February I brewed the young batch to which I added a gallon of organic pomegranate juice last week. Next weekend I’m going to blend the two batches together with another infusion of pomegranate juice. I’m quite hopeful that POMEGLAMBIC will turn out to be quite a successful experiment! Pomeglambic will be offered at an upcoming Parched Eagle investor relations party. And who knows? Maybe a few years down the line it will be brewed on our one barrel sour system! Cuisine (Barbecue) Cheese (sharp; Blue, Cheddar, pungent; Gorgonzola, Limburger) Meat (Beef, Grilled Meat). This was the consensus favorite and is probably one of the best beers I’ve ever had. Elegant, sublime, smooth, and dangerous at 11.3% abv! A sense of malt/sugar balance throughout the flavor profile with a lovely dry finish. A very well attenuated (completely fermented) beer! As far as pairing this beer with food: it went well with everything we had, because it’s just so damn good! This was the only Trappist brewery dark strong we had, and quite a spectacular one. 2) St. Bernardus Abt 12. This one came from behind late to be the consensus second place choice. A bit sweeter than the Rochefort 10 but nonetheless finished pretty dry (a hallmark for the style). Strong toasted/caramel malt aroma and flavor with appropriate dark fruit esters (raisins, figs, prunes) quite evident, as well. Like the Rochefort 10 it pretty much went well with any of the food. This stellar French-Canadian beer really stood out because of the spices used in its recipe. Neither Tom, Geoff or I really realized just how spiced this Dark Strong is until we had it with these other ones (though even Rochefort 10 uses a little coriander). Basically, its got all the desirable aroma and flavor characteristics of the style that are augmented by somewhat considerable use of spices. The spices apparently used are anise and orange zest. As with the first two medium high carbonation that makes this style quite “digestible” (as the Belgians like to say) and finishes quite dry. A wonderful beer, but a little off style because of the spices. It was a favorite with the dark chocolate because of the spices. We agreed that Stella held up well with all of these stellar Dark Strongs, with a depth of malt flavor and aroma appropriate for the style. What made Stella stand out was the relatively high hop bittering level (at the top end of the range for the style) and use of wildflower honey, which lent a nice midly spicy sweetness contrasted with the sugars used in the other beers (candy sugars are common ingredients for Belgian beers, certainly including Dark Strongs). We noted that Stella went best with the Renard’s two year old cheddar because of the hop bitterness in the pretty dry finish. A question moving forward is whether to ever use wildflower honey in Stella at the Parched Eagle? An intriguing thought. 5) Gouden Carolus Grand Cru of the Emperor. A wonderful beer, but definitely the sweetest of the bunch with an enormous caramel malt flavor that smacks you across the face (in a good way, of course). A relative one trick pony in terms of complexity of aroma and flavor: the caramel malt is so dominant it pushes fruity esters and anything else (except alcohol) way in the back. Also finished the sweetest of any of these Dark Strongs. Geoff noted that its huge caramel malt flavor went well with the caramel crunch in the dark chocolate. Leave it to me to post about a German beer festival on St. Patty’s Day(?). Last Saturday I attended the Capital Brewery’s first Starkbierfest. Starkbier (strong beer) festivals occur in Bavaria in March and were originally started by monks at the Paulaner brewery centuries ago. The fine folks at Capital decided to give this concept a try: expanding the concept to both strong and sour beers. 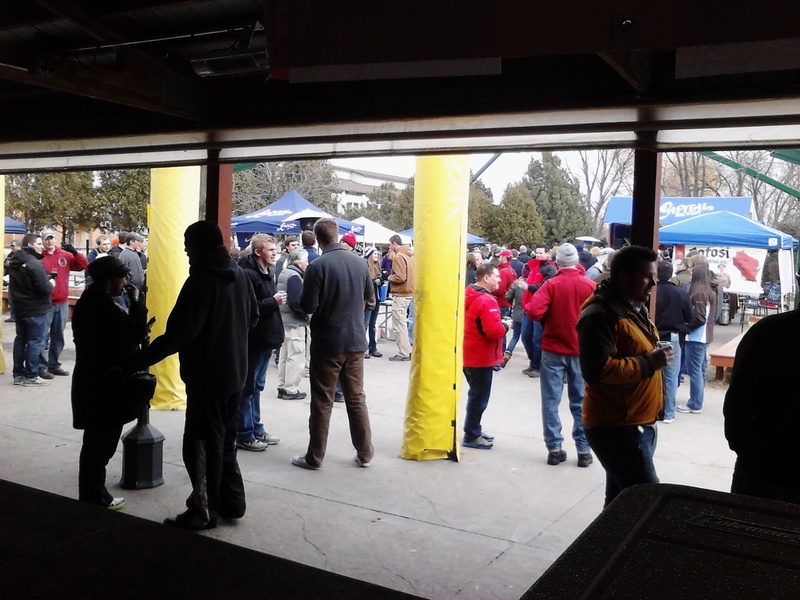 Several local/regional breweries participated. 1)Barrel aged Toil & Trouble from Sweet Mullets. This is a collaboration beer from Sweet Mullets and Vintage Brewery. I had the Vintage non barrel-aged version at the Mason Lounge last year and was duly impressed. The Sweet Mullets’ whiskey barrel aged version was even better! Toil & Trouble is a gruit: an ancient style of ale that traditionally used a variety of herbs and spices that pre-date the use of hops in beer. Toil & Trouble has heather and mugwort in it. Another aspect of ancient styles of beer is an intrinsic sour character as brewers of yesteryear did not engage in proper sanitation methods. Toil & Trouble has a wonderful sour character that is pretty similar to a Belgian Flemish Red ale. I think the reason why I liked Sweet Mullets’ better is not the fact that it’s barrel aged, but rather that the sour character has developed wonderfully over the past several months since I had the Vintage version. So nice I went back twice! Holy crap what a sublime huge caramel malt slap across the face! Wonderfully complex throughout in terms of sweetness, toasted malts, alcohol, and dark fruity esters. All of these were balanced out just enough by hop bitterness and (very little) hop flavor and aroma. Very well done effort at an English barleywine and the 12% abv was actually fairly well masked. So nice I went back twice! Not only possibly named after a Pixies album, also a damn interesting and tasty beer! Part Imperial IPA and part Saison, the marriage of French Saison yeast (one of my favorite strains that will be used for all of the Parched Eagle’s saisons) with tropical citrusy hops totally works! Wicked at 9.5% abv. I think this hybrid works because Saison is one of the hoppier Belgian styles: the yeast works really well with significant hop bitterness as well as flavor and aroma. 4)Next Door Brewery Heather Sent Wee Heavy. The use of heather tips lends a really interesting earthy flavor to this big (9.3% abv) scotch ale. It starts earthy and finishes caramel malty: nice! 5)House of Brews Strong Ale brewed with honey. The honey lent an almost mead-like flavor that nonetheless finished dry rather than sweet with some nice balancing bitterness. Nice! 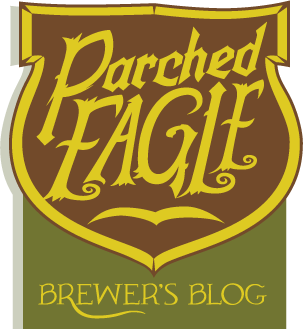 IF the Parched Eagle participates next year we’ll have a lot of fun thinking about our beers to offer. The possibilities are many. Hmm, maybe Geronimo with Verily and Brookie’s Sour Brown? The Parched Eagle wants YOU (to invest)! Tonight I’ve got my President of the Parched Eagle hat on as we are in need of a few generous investors to make the brewpub a reality next fall! The Parched Eagle Brewpub will raise $250,000 for the construction of the brewpub and first year of operations. $50,000 will be from investors and $200,000 in the form of loans from the Small Business Administration and possibly Brewery Finance, a leasing company for brewing equipment. We are also exploring other possible sources of startup funding (details available upon request). Vice President Tom Christie and I have been discussing investment options, and have consulted with our banker at the Summit Credit Union on ways that potential investors can receive a return on their investments. We have written a strong business plan including income and expense projections for the first three years of operation. We have come a long way down the path of opening the Parched Eagle and have a long way to go. With your help we can get there! We feel that the Parched Eagle is a strong investment opportunity for someone who has a love of craft beer that is brewed by a locally-owned business. Our goal is to produce world-class beers that will add greatly to the Madison area craft brewing scene. Interested? Then please feel free to contact me via email (jim@parchedeagle.com) or phone (608-204-9192). I look forward to talking with you and can provide you with a host of information and insights. The Parched Eagle Brewpub will raise $250,000 for the construction of the brewpub and first year of operations. $50,000 will be from investors and $200,000 in the form of loans from the Small Business Administration and Brewery Finance, a leasing company for brewing equipment.